I'm sure I sound like I have lost my marbles to anyone who is not passionate about knitting. But, I have a new favorite yarn, and I really don't care who knows about it. Snug. I love you Snug. I love you for your cashmere content and for your beautiful, smooth, round, bulkiness. And I love how you take color. All of them. I loved you right out of the box, even before the first time I put you on my needles. I love you even more, now that I've knit a second hat out of Snug, my second using the Nevermind cabled pattern. It is what you were meant for. Forgive me for the glamour shot. I'm rather partial to the model as well. But she still doesn't get to keep the hat! The colorway is Fisherman's Wharf, a neutral with just a hint of a purpleish undertone in the right light. So subtle that you're not even sure it's there. So beautiful that I'm kicking myself for not getting a sweater quantity. Here is the obligatory cat photo. I was chided, after the lovely photo of our baby cat Juliet earlier this week, for not including our cats in more photos. So here is Harry, who is skilled at photobombing, but agreed to pose just this once. In case I haven't been clear, if you don't have any of The Plucky Knitter Snug in your stash you need to RUN not walk and get some. You can buy it at her periodic updates or through destash on Ravelry if you're lucky. It's amazing yarn. You need to knit with some now! 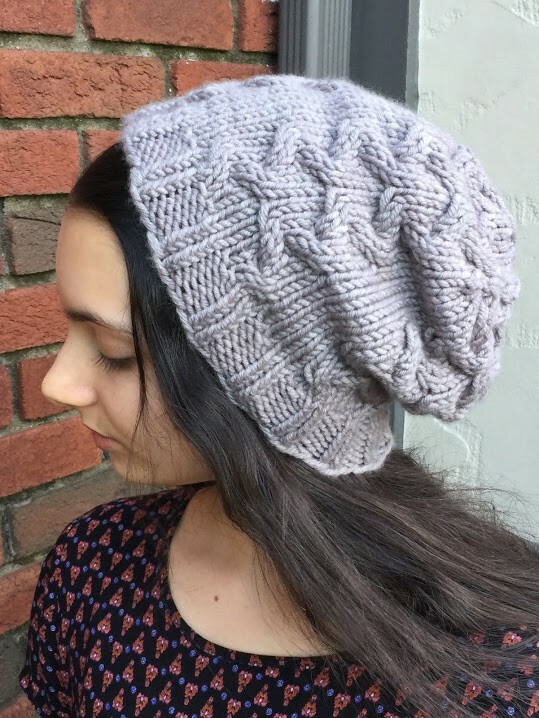 The hat is adorable – the model, of course, is beautiful.